If Google can’t find you, neither can your clients and customers. When you own a business today, it’s no secret that you need to be easily accessible online which means that Google needs to be able to find you. This is known as your Search Engine Optimization: how you rank when someone searches for your product or service. When your clients are looking for your service and they type in “Minneapolis plumber” or “El Paso spa,” Google and other search engines go to work. They use a complicated algorithm that, among other things, scans for keywords, looks for high traffic sites, and prioritizes pages accordingly. It produces millions of results in only fractions of a second. It’s their system for figuring out what to show first. Knowing this, how do you tell Google that you are relevant? How will Google know that your site and your business are not dormant and you deserve to be at the top? Most people see blogging as no more than a passive way to communicate a message to others. Blogs can be fun, informational, creative, or personal. Blogging is all these things, but it accomplishes two things for the business owner. First, it provides education to your target market when they visit your site. Second, it tells Google that you are an active business, and that your site is current and relevant. So with that, here is your to do list for blogging to increase your Search Engine Optimization. Timing. Blog consistently. Posting one blog a week is going to be more beneficial to your SEO than posting a bunch of them once every couple of months. Consistency is going to bring regular hits to your site since there is always something new to share. This increases your traffic to your site, another thing that Google looks for. Keywords. Keywords are simply words related to your work and your site. Google looks for keywords scattered throughout text. They must be scattered through text. Simply listing keywords separated by commas will be flagged as spam by the search engine and you won’t be found. The more keywords your site has, the more your SEO goes up. Each blog is another webpage linked to yours. That makes it a perfect opportunity to fill up a page on your site with keywords for search engines, all while educating your clients about your service or business. Link. As your blog grows, link related posts together so you can get more hits. Share. Use social media. Share your blog posts on local pages. The more traffic your site has, the higher your Search Engine Optimization ranking gets. If you see the benefits of blogging but you do not like to write, consider hiring a ghostwriter. Outsourcing for your blog is a huge investment in your business since it will help you to be found online. Check out “What to Look For in a Ghostwriter” for more. A good ghostwriter will be able to write for your audience and for Google simultaneously. 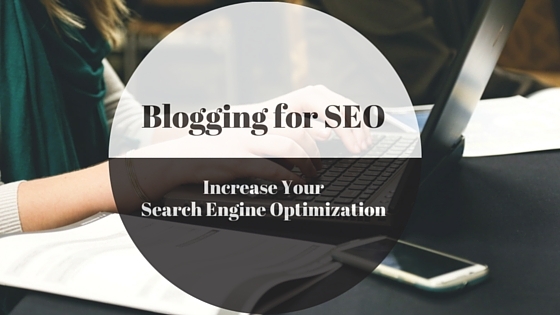 Blogging is your secret weapon in your Search Engine Optimization. SEO does not have to be complicated and neither does your blogging. If you want to be found, blog. Google will love you for it. Very helpful tips, Brian. I still have yet to figure out why those who have businesses, don’t blog about them? Especially if you’re selling services. It’s beyond me. Gladly passing your post along. I was researching about SEO last night, & I can use all the help I can get! Thanks Brian! Good info. I’m curious when you mention keywords in blog posts, are these words you just use in your writing and google identifies them as keywords or do you have to “do something” to those words to make google aware that they are keywords?? You just use them a few times in your articles. I use long tail Pro to figure out what keywords are people searching for and the competition. Thank you! I will start to notice in my writing if I”m staying on topic and using keywords that when searched will direct more traffic to my posts. I appreciate the tip! Thank you, Brian. I am just starting out on this blogging journey again, bound and determined to make it this time. Thank you for the tips. Keywords and SEO are confusing to me but I can be consistent. Thanks again. If you need any help or don’t understand anything pleases reach out and I’ll try my best to help out. Thanks! I just recently discovered SEO and keywords and am really behind. I have a lot of work to do! That is so true. I think the long tail keywords are so important too. Since I have been using them in my titles I have noticed a big difference. There are obviously tricks that some bloggers master to increase their audience. I watched a youtube video about how to get people to visit your blog and there certainly was a mention about the significance of “keywords”. I am writer desperately trying to promote my book with only limited success. I can’t agree more. I try to explain to many of my customers that they need to have a blog in this day and age. Although, just to have a blog section on your website, is not going to make a difference. Thank you for pointing out the important aspects!